Siding – Examine wall/roof intersections, corners, window trim, and architectural details (brackets for example) for indications of rot. Look for cracked or peeling paint that may indicate water damage. Foundation – Examine limestone or concrete block foundation walls for missing and/or loose mortar. 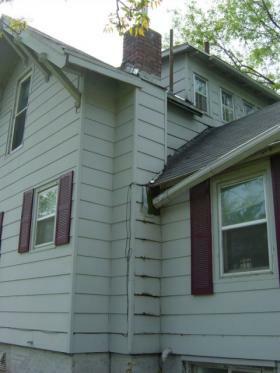 Minor cracks in the foundation may be a function of acceptable settling – they can be filled. Large cracks need to be examined by a professional. Plaster – Small diagonal cracks around doors and windows can happen over time as the house settles. These can usually be patched. Large areas of cracked, damaged or sagging plaster may need to be replaced and may indicate underlying structural issues that need to be corrected. Areas of discolored plaster may indicate water leakage through the roof or adjacent wall. Fire Damage – A professional should assess any fire-damaged portion of the building. Some indications of fire damage include black char marks outside windows, soot stains on walls and ceilings, exposed charred joists, missing sections of roof and significant water damage in only one portion of the building. Water Damage – Long-term exposure to ice and water can severely compromise a building’s structural integrity. Look for areas where the floorboards are coming up, where the roof is missing or damaged, plaster has fallen to the floor, the joists and/or floorboards have significant “give” or areas of visible mold and mildew. Do not walk on any questionable area. Beams and Joists – Examine the beams and joists in the basement for large cracks, areas of rot or mildew, missing posts, and large sags. Each of the above issues may result in rebuilding or removing a portion of the structure. If you think that the building may have one or more of these problems, contact a professional. If structural remediation is required, be prepared for it to take a significant amount of time and/or money. Sometimes, the building systems have been stripped out of abandoned buildings for resale, reuse, or scrap metal. If furnaces, electrical wiring, and plumbing remain, you will need to assess their condition and determine what, if anything, can be saved. Look for missing sections of copper supply line in the basement, lead pipe coming into the residence from the water main, and any areas of obvious water damage caused by leaking pipes. Areas of cracking concrete in the basement may indicate a collapsed cast iron sewer line as may sinkholes in the back yard. If you intend to relocate any of the plumbing fixtures in the bathrooms and kitchen, and the original cast iron waste stack/vent is still in place, you will probably need to convert at least a portion to PVC. Your plumber may be able to tie in to the existing sewer line – he or she can “camera” the sewer to determine its exact condition. Fuse boxes, knob-and-tube wiring should be upgraded to at least 100 amp service (possibly 200 amp depending on the size and load requirements). Substantial renovations may require a complete rewire to conform to current codes. Some insurance companies will decline to cover buildings with knob-and-tube wiring. It is not inherently unsafe – in fact, the hot and neutral wires are completely separated. As long as the wiring is not disturbed (which may degrade the insulation) you shouldn’t feel particularly unsafe in a home with knob and tube wiring. The main problems are that there is no ground wire and the wiring itself may be undersized for modern electrical loads. Other things the lay person can look for are smoke detectors, missing switch plates and outlet covers, and GFI-protected outlets in kitchens and bathrooms. You can also check to see if all light fixtures are operational. If the gas and electric service are connected, adjust the thermostats to turn the HVAC units on to test them. Look for evidence of leaking at all radiators. If there is a forced-air unit verify that air gets to the furthest ducts and is an appropriate temperature. Keep in mind that if you want to change the floor plan as part of your renovation, it may require alterations in the HVAC system (size or duct layout).